Catholic Schools Week: The schedule of activities for Catholic Schools Week will include activities and events designed to celebrate the theme “Catholic Schools: Learn. Serve. Lead. Succeed.” We are looking forward to an exciting and enjoyable week for everyone. Our Open Houses will be on Sunday, January 27th from 1:00 – 3:00 for Siblings and Newcomers. Click here to pre-register for our Open House. Come and see what St. Peter Central Catholic has to offer both you and your child/children. 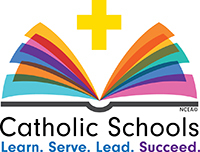 Please click here to download a copy of our Catholic Schools Week Schedule 2019. Come and be part of our St. Peter Central Catholic family. Tickets start at ONLY $15, and come with a FREE Worcester Railers t-shirt for the first 1,000 tickets purchased! The link is attached here- www.railershc.com/catholicschools. Let us know when you order your tickets so that we can prepare for our night! Inviting all prospective students and families to our Open House from 1pm-3pm. Math Bingo Monday- Students will enjoy a rousing game of Math Bingo! Crazy Socks- Show off some flash on your feet! Pastor’s Luncheon- Our Pastors and Priests will come and share lunch with our students. STREAM Afternoon- Students will partake in STREAM activities in each classroom. Grades 5-8 will rotate through activities. First Responder’s Mass 10:30am in the Sheila Gaduoa Auditorium. Join us as we celebrate Mass and show our gratitude to all who keep us safe each and everyday. Bishop McManus and Monsignor Scollen will celebrate Mass. Throwback Thursday-Students will visit their classroom from the previous year to catch-up. Ice Cream Party – The PTA will serve ice cream to the students in the afternoon as a show of appreciation. School Spirit Day- Dress down in Red and White to show your Hawk pride! Kindness Rocks-Students will paint rocks with inspirational quotes to create a kindness rock garden.